McDonald’s is giving away free Chicken McNuggets on Wednesday. You can order your free nuggets for delivery through UberEats. 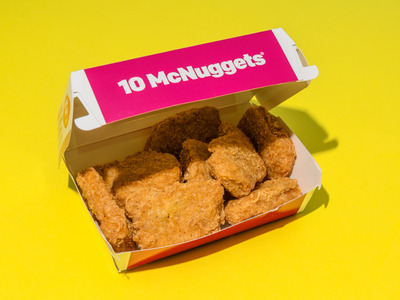 UberEats is delivering free Chicken McNuggets from McDonald’s. From 11 a.m. to 10 p.m. local time on Wednesday, UberEats is delivering free 10-piece chicken nuggets from McDonald’s, while supplies last. All you have to do is open UberEats and go to the McDonald’s page. Add the special, free 10-piece Chicken McNuggets to your cart – and the only thing you’ll have to pay is the booking fee. McDonald’s started offering delivery in the US through an UberEats partnership in January. According to executives, the partnership has been a huge hit, with the average customer paying one-and-a-half to two times as much for their delivery order than the average in-store shopper.